Distribution systems have traditionally not involved much automation. Distribution equipment, once installed on feeders, was expected to function autonomously with only occasional manual setting changes. Capacitor bank switches might switch on or off based on local signals, such as time of day or current. After a local fault condition, reclosers would attempt reclosing a set number of times before locking out. Lateral fuses would blow if the current became too high. In a legacy grid architecture, service calls were made by truck, switch positions were changed manually, and there was no sensors, communications or intelligence. Utilities today have a fragmented view of operations derived from the silos approach and dependence on proprietary technologies that lack the ability to communicate with each other. Beyond operations, the fragmented view impacts utility system planning, as well. At the beginning of each week, electric utility managers design on paper an electric network model based on anticipated conditions, which describes the current status of all the systems that comprise the distribution grid, but the planned design they envision is not maintained throughout the week. In fact, walking through an energy control center today would show multiple operational units monitoring and managing different parts of the grid, from DCS to EMS/SCADA to OMS to AMI to DR, each with a distinct view of the state of the grid provided by the stand-alone proprietary systems. It is left to the human grid operators in the control center to integrate these disparate views of the grid and make management decisions with the information they have at hand. Recently, in response to the growing demand to improve reliability and efficiency of the power system, more automation is being implemented on the distribution system. Distribution Automation is one of the four federal Smart Grid focus areas and the Smart Grid policy requirements as outlined in Energy Independence and Security Act (EISA) of December 2007 increase the need for Distribution Automation. In the past solar has been an immaterial contributors to the grid, but what happens when 20 percent or more of the homes in a neighborhood go solar and a cloud passes overhead? That changes a neighborhood of solar power producers to utility power customers in a matter of minutes – and grids built to deliver power one way at constant voltages and frequencies have trouble accommodating that two-way, intermittent flow. Too much solar power, and local grid voltage could rise, causing potential problems for motors, lights and other equipment. Too little, and voltage can sag. That may only flicker light bulbs at home, but it can lead to million-dollar work stoppages for customers like semiconductor manufacturers and server farms that need clean power at a near-to-constant voltage and frequency. Eventually the smart grid — like broadband networks do — will have some sort of distributed model of computing where automated decisions are made at the edge of the network but with some sort of supervisory control layer. That distributed computing model will be quite different from the centralized mainframe model and point-to-point system that utilities largely have in place today. During the next decade, utilities are expected to make significant investments in substation, feeder, and transformer automation technologies and solutions. Investments in automation are expected to cover many of the world’s medium-voltage (MV) primary and secondary substations, MV distribution feeders, and low-voltage (LV) transformers, eventually enabling a self-healing smart grid. According to a new report from Navigant Research, global annual DA and SA revenue is expected to grow from $7.6 billion in 2016 to $12.2 billion in 2025. Accessible, Visible, Lockable, Disconnect: A device is used by utility maintenance personnel to ensure that the DER will not energize the line during maintenance activities. The device meeting this requirement may or may not also serve as an NEC-required isolation means. ADA - Advanced Distribution Automation – A term coined by the IntelliGrid project in North America to describe the extension of intelligent control over electrical power grid functions to the distribution level and beyond. Normally, electric utilities with SCADA systems have extensive control over transmission-level equipment, and increasing control over distribution-level equipment via distribution automation. However, they often are unable to control smaller entities such as Distributed energy resources (DERs), buildings, and homes. CA - Contingency Analysis of Distribution System - Power systems are operated so that overloads do not occur either in real-time or under any statistically likely contingency. Complex Example: outage of a several lines, a number of generators, and the closure of a normally open transmission line. Distributed Intelligent Controls – Actions carried out in the field based on algorithms. Topology model: 3-phase physical connectivity of the distribution system, often found in Geographic Information Systems, Automated Mapping systems, and paper drawings. This configuration model includes connectivity to the transmission system, interconnections between feeders, locations of aggregated loads, and connections to distributed energy resources. Facilities model: power system equipment such as circuit cable characteristics, substation transformers, circuit breakers, capacitor banks, voltage regulators, and feeder switches, as well as the capabilities of the equipment controllers. This facilities data is derived from the Facilities Management system and other engineering databases. Load model: aggregated loads with load profiles, associated with locations along feeders. These load models are derived from the Customer Information System (CIS). Transmission interface model: the characteristics of the interfaces between the transmission system and the distribution system. This transmission model is extracted from the Energy Management System power system model. Real-time data: distribution system status and measurement data from the SCADA system applied to the combined models, so that the result is an up-to-date model of the current distribution system, showing actual electrical connectivity and power system measurements. DTS - Dispatcher Training Simulation - Provides new and experienced dispatchers with training on the actual power system they are operating, by providing scenarios of events and circumstances that they must respond to. FCI – Fault Circuit Indicator - A device which provides visual or remote indication of a fault on the electric power system. Also called a faulted circuit indicator (FCI), the device is used in electric power distribution networks as a means of automatically detecting and identifying faults to reduce outage time. Fault - Any abnormal flow of electric current. For example a short circuit is a fault in which current flow bypasses the normal load. An open circuit fault occurs if a circuit is interrupted by some failure. In three phase systems, a fault may involve one or more phases and ground, or may occur only between phases. In a "ground fault" or "earth fault", current flows into the earth. The prospective short circuit current of a fault can be calculated for power systems. In power systems, protective devices detect fault conditions and operate circuit breakers and other devices to limit the loss of service due to a failure. Re-energizes undamaged portions of the feeder via the primary feeder source and one or more backup sources using remote controlled tie switches. Superconducting Fault Current Limiters come in two major categories: resistive and inductive. In a resistive FCL, the current passes through the superconductor and when a high fault current begins, the superconductor quenches: it becomes a normal conductor and the resistance rises sharply and quickly. Inductive FCLs come in many designs; the simplest is a transformer with a closed superconducting ring as the secondary. In un-faulted operation, there is no resistance in the secondary and so the inductance of the device is low. A fault current quenches the superconductor, the secondary becomes resistive and the inductance of the whole device rises. The advantage of this design is that there is no heat ingress through current leads into the superconductor, and so the cryogenic power load may be lower. However, the large amount of iron required means that inductive FCLs are much bigger and heavier than resistive FCLs. IED - Intelligent Electronic Device - Research and development is needed to improve software updates to field devices. ITL - Intelligent Line Switching - The monitoring and control of distribution primary voltage switching devices to interrupt, restore, and redirect the flow of power across the power distribution system. Intelligent line switches are generally limited to those switches that are “electrically operable”. An electrically operable switch is one that includes an operating mechanism that stores energy needed to open or close the switching device and can be operated by pushbutton or remote control. Electrically operated switches include substation circuit breakers, motorized disconnect switches, automatic load break switches, line reclosers, and sectionalizers. ILS functions can be subdivided into two main categories: Fault Location Isolation and Service Restoration (FLISR) and Optimal Network Reconfiguration (ONR). Recloser - Sense and interrupt fault currents by opening their breaker. Attempt reclosing their breaker after a fault is detected on a feeder, usually three to four times before locking open. Restore service via a remote control command after automated or manual switching has isolated the faulted feeder section. RPR - Relay Protection Re-coordination of Distribution System - Adjusts the relay protection settings to real-time conditions based on the preset rules. This is accomplished through analysis of relay protection settings and operational mode of switching devices (i.e., whether the switching device is in a switch or in a recloser mode), while considering the real-time connectivity, tagging, and weather conditions. The application is called to perform after feeder reconfiguration, and, in case, when conditions are changed and fuse saving is required. No fault calculations are needed in this application, if the distribution system is radial without significant DER. RTU – Remote Terminal Unit - Substation master station which collects the appropriate data for transmission to the control center, and which passes control commands on from the control center to the electronic equipment. SCADA - Supervisory Control and Data Acquisition - SCADA systems at the control center monitor status and measurements of distribution equipment in substations. Self Healing - A system that does not have a “single point of failure." Transmission system is inherently self-healing. Self-Heals A self-healing modern grid detects and responds to routine problems and quickly recovers if they occur, minimizing downtime and financial loss. Smart Switch - Automated switches are installed along feeders and at feeder tie-points. These automated switches can communicate with each other locally (typically within a few miles), and are programmed to respond appropriately to feeder fault conditions. Peer to Peer between each of the switching points and substations. Takes the burden off central communication. Standard protocols (DNP etc.) data packets. Transfer Trip - For a Generating Facility that cannot detect Distribution System faults (both line-to-line and line-to-ground) or the formation of an Unintended Island, and cease to energize EC’s Distribution System within two seconds, EC may require a Transfer Trip system or an equivalent Protective Function. Distribution Automation includes using real-time information from embedded sensors and automated controls to anticipate, detect, and respond to system problems, a smart grid can automatically avoid or mitigate power outages, power quality problems, and service disruptions. You can only throw so much labor at making continuous adjustments to the grid, people in the field making constant adjustments to the switch plan, to rerouting power, that's just not realistic. So they really need technology to help them be more proactive about managing the impact of these devices that with increasing frequency will be connected to the edge of the network. The frequency of distribution grid adjustments will increase in the future—how quickly will vary by utility. Eventually they'll need to react quicker to changes in power flow both on the demand side and the supply side. The solution is to automate some monitoring and control functions and devote personnel to more complicated issues. In the case of urban/city networks that for the most part are fed using underground cables, networks can be designed with interconnected topologies so that failure of one part of the network will result in no loss of supply to end users. It is envisioned that the smart grid will likely have a control system that analyzes its performance using distributed, autonomous reinforcement learning controllers that have learned successful strategies to govern the behavior of the grid in the face of an ever changing environment such as equipment failures. 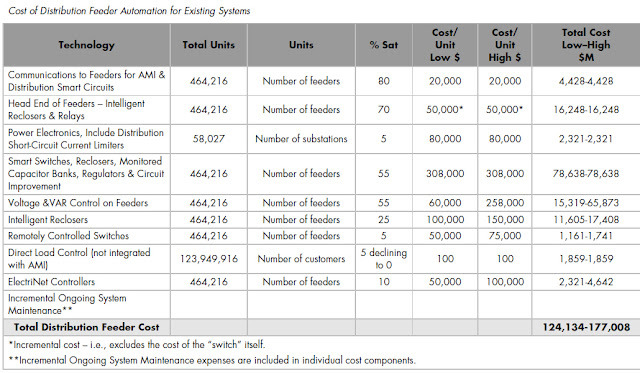 Such a system might be used to control electronic switches that are tied to multiple substations with varying costs of generation and reliability. The substation of the future will require a wide-area network interface to receive and respond to data from an extensive array of transmission line sensors, dynamic-thermal circuit ratings, and strategically placed phasor measurement units. The smart substation must be able to integrate variable power flows from renewable energy systems in real time, and maintain a historical record or have access to a historical record of equipment performance. Combined with real-time monitoring of equipment, the smart substation will facilitate reliability-centered and predictive maintenance. The lower cost of automation with respect to T&D equipment (transformers, conductors, etc.) is also making the value proposition easier to justify. With higher levels of automation in all aspects of the T&D operation, operational changes can be introduced to operate the system closer to capacity and stability constraints. Basic Reliability Scenario – Local Automated Switching for Fault Handling - Covers the use of SCADA to the substation, automated switches on feeders that respond to faults locally, and SCADA monitoring of these automated switches. 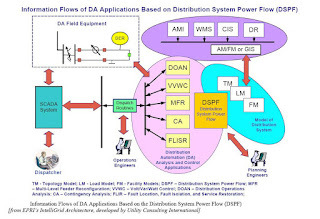 Advanced Reliability Scenario – FLISR with Distribution System Power Flow (DSPF) Analysis - This Use Case utilizes the power flow model of the distribution system as the primary means to assess real-time conditions by providing full power system visibility to operators, and by providing software applications with a computerized model of the power system for them to perform their analyses. With smart meters and AMI in place, FLISR becomes a process, an application, that's more readily enabled because the meters act as sensors that can trigger an alarm that the power is out. With meters, FLISR becomes more accurate and restoration goes more quickly. Efficiency Scenario – Efficiency Assessment with DSPF Analysis - Efficiency of the distribution system is often considered of secondary importance to reliability, but can become of significant interest on specific feeders and substations that are handling high loads and/or variable power factor situations, so that it actually can improve reliability. The Efficiency Use Case utilizes the ADA’s DSPF model of the distribution system, along with real-time data from the SCADA system, to assess first the adequacy (will the equipment be able to handle the expected loads) and the efficiency (how efficiently is the power system operating and what can be done to improve that efficiency). DER Planning Scenario – Planning, Protection, and Engineering of Distribution Circuits with Significant DER Generation - Distribution planning and/or engineering must assess each proposed DER interconnection to ensure it meets the required interconnection standards. They must also assess any impact on distribution feeders, feeder equipment, substations, distribution operations, maintenance procedures, etc. to accommodate the DER interconnection. If changes must be made, these changes must be engineered and implemented before the DER interconnection is finalized. Basic Real-Time DER Management Scenario – SCADA Monitoring and Control of DER Generation - Larger DER units and aggregates of smaller DER units are impacted by, and can impact, realtime distribution operations. SCADA monitoring and (direct or indirect) control of these DER units allows them to be “visible”, thus adding to reliability and safety of distribution operations. Advanced Real-Time DER Management Scenario – DSPF Analysis for FLISR, Microgrids, Safety, Market with Significant DER Generation - Involves analyzing the distribution system in real-time or “near” real-time to determine actions in response to planned or unforeseen situations that involve significant DER generation/storage. This analysis would be needed for fault location, isolation, and service restoration, protection coordination, establishment of microgrids, safety of field crews and the public during outages, power quality, market operations involving DER units, and many other activities. This type of analysis would be impossible for distribution operators to handle without support from the DSPF model that forms the foundation of the ADA capabilities. The DSPF model would need to cover not only the distribution system but also the larger DER units as well as some model of aggregated small DER units. Distribution Maintenance Management with DER Scenario – Maintenance, Power Quality, and Outage Scheduling with Significant DER Generation/Storage - Maintenance of the distribution system that includes significant DER can be a new challenge. As the number of DER units grows and as the amount of generation is derived from DER units, distribution operations will no longer be able to manage the maintenance of the system without significant support from automation. Demand Response with DER Scenario – Distribution Operations with Demand Response and Market-Driven DER Generation/Storage - With the inclusion of DER generating and storage capabilities, demand response becomes even more complex, and requires Advanced Distribution Applications (ADA) using the DSPF model. Without such automation, distribution operations with demand response would become extremely difficult if not impossible. Automation of switches can avoid the need to send personnel to the field to perform the switching. Monitoring of capacitor banks and other feeder equipment can avoid the need to send personnel to check or test their status or change their parameters. Monitoring of field equipment can provide maintenance personnel with more accurate historical and current information, thus allowing more timely maintenance or avoidance of maintenance when not needed. Real-time knowledge of distribution equipment/line status, including length of time of any overload situations, so not reliant on “worst case” planning criteria. Power Reliability - Including reduced number and length of outages, reduced number of momentary outages. Limit the number of customers impacted by system outages. Power Quality - Cleaner power, and reliable management of distributed generation in concert with load management and/or microgrids. Deploy equipment that automatically adjusts to voltage fluctuations and system disturbances to prevent customer impacts. Safety and Security - Including increased visibility into unsafe or insecure situations, increased physical plant security, increased cyber security, privacy protection, and energy independence. Energy Efficiency - Including reduced energy usage, reduced demand during peak times, reduced energy losses, and the potential to use “efficiency” as equivalent to “generation” in power system operations. Environment and Conservation – Including reducing greenhouse gases (GHG) and other pollutants, reducing generation from inefficient energy sources, and increasing the use of renewable sources of energy. Scalability - Economical to start small, get big. Easy to add equipment. Upgradability - Sometimes virtually embedded transmission and distribution assets have different failure rates and life expectancy than the majority of today’s grid technologies. These failures and resultant replacement rates must be estimated. Utilizing a reliable component, like a substation transformer, with a 40-year design life and incorporating an information technology with 10, 15 or 20 life forces careful consideration of the costs to upgrade the embedded components. Interconnectedness of Distribution Automation Functions - Individual distribution automation (DA) functions, such as monitoring VARs on a feeder or detecting faults on a circuit, cannot have their benefits or challenges assessed in isolation. Most of these DA functions can only be cost-effective if they are part of a larger set of functions. In addition, many of the DA functions must rely on “primary functions”, such as SCADA monitoring and control, to even begin to provide some benefits. Inherent Lack of Redundancy in Radial Distribution Networks - As applied to distribution networks, there is no such thing as a "self healing" network. If there is a failure of an overhead power line, given that these tend to operate on a radial basis (for the most part) there is an inevitable loss of power. Latency - Fast Communication Speed Needed - 50 ms communication time requirement is high for hand shakes. If you don’t do it fast enough, the main circuit breaker flips. Latency is a big deal for distribution automation, which needs a network that can execute some commands at the speed of the grid, so to speak – that is, the 60 hertz, or cycles per second, at which U.S. utilities deliver their power. The unit is the cycle, so a 60-hertz cycle is basically 17 milliseconds per cycle. There could be faster applications with a WiMax solution, which promises low latency on top of effective data rates of 2 to 3 megabits per second, compared to SpeedNet's 650 kilobits per second. Legacy Equipment & Applications - Most of the North American electricity system infrastructure is 40 to 50 years old and nearing the end of their useful life. Many legacy applications simply cannot scale to handle the Smart Grid's required levels of data volume and complexity. 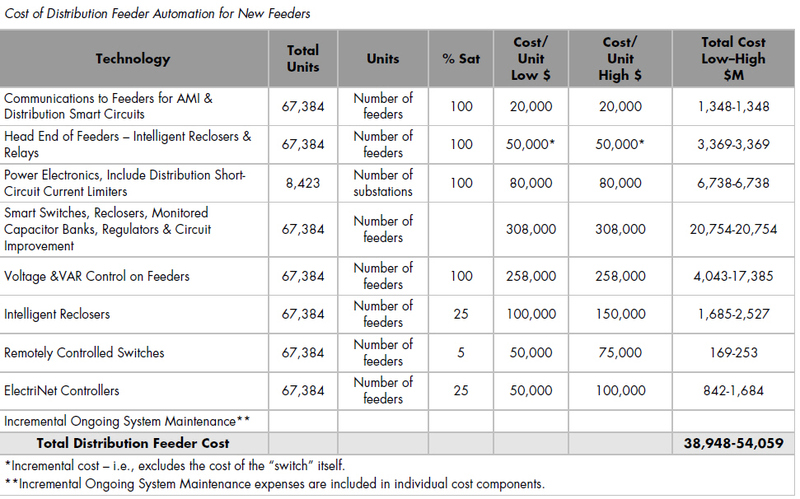 DER Proliferation - If you start putting a lot of storage in substations, there’s going to be new automation needs. Data Management - Often data management methods which work well for small amounts of data can fail or become too burdensome for large amounts of data – a situation common in distribution automation and customer information. Systems Integration - The key issues include interoperability of interconnected systems, cyber security, access control, data identity across systems, messaging protocols, etc. Configuration Management - Modern relays are IP-addressable, but require on-going operational technology governance to manage security, firm-ware changes, configuration changes, maintenance, health checks, version control, and compatibility testing. New relays have hundreds of set points and a broad range of stored history, but most utilities use only a fraction of their functionality. Merging SCADA and Protection. - For several years now, it has become apparent that substation automation using intelligent devices and modern LAN technology requires the integration of substation functions. Protection devices must be capable of control and monitoring, and SCADA devices must take some part in protection. Similarly, the parent organizations of these devices must learn to communicate with each other. Merging IT and Operations. As utilities deploy enterprise bus technologies, the traditional separation between corporate IT and utility operations organizations must narrow, especially to address security issues. Merging Distribution Automation and Metering. These two systems previously had nothing to do with each other although they shared a common geographic area of responsibility. Soon they will likely make use of a common, ubiquitous distribution communications network. Similarly, their respective organizations must now integrate operating procedures to realize some of the advantages of an integrated Smart Grid, such as advanced outage management. Phased Approach – A phased approach can be used in distribution automation, because, unlike tightly networked transmission systems, distribution systems can fairly easily deploy pilot projects or initial implementation of DA functions that affect only a few feeders. Lessons can be learned from these initial deployments which can improve eventual deployment of the functions to a larger set of feeders. Distribution Automation Scenarios, - Developing use cases based on both secondary and primary DA functions, allows utilities to understand both the benefits and the challenges involved in implementing these functions. Primary functions typically require heavy capital expenditures to implement equipment, communication, and data infrastructures whose payback can only truly come when one or more secondary functions utilize these infrastructures. ABB Zurich Switzerland(NYSE: ABB)- Substation protection and control solutions ensure reliable power transmission and distribution. To ensure interoperable and future-proof solutions, their products have been designed to implement the core values of the IEC 61850 standard. Alstom Grid - (NYSE: GE)- Atlanta, GA A GE and Alstom join venture is serving customers globally and equips 90% of power utilities worldwide to bring power reliably and efficiently from the point of generation to end power consumers. The joint venture. serving customers globally with over 20,000 employees in approximately 80 countries. Grid Solutions helps enable utilities and industry to effectively manage electricity from the point of generation to the point of consumption, helping to maximize the reliability, efficiency and resiliency of the grid. BPLG provides monitoring and communications solutions for improved efficiency and reliability of the distribution grid. Their Rapid Fault Locator solution detects and reports line faults on distribution feeders, and provides continuous monitoring of the line conditions avoiding faults and reducing the duration of outages. An intelligent grid depends on a secure and robust communications platform to manage the significant increase in data capacity required to support two-way communications between a centralized software platform for monitoring and control and any smart devices distributed throughout the electrical network. BPLG offers communications solutions from basic network monitoring, to robust smart grid communications, to last-mile broadband services to consumers and businesses. Eaton Cooper Power Systems - Waukesha, Wisconsin - Eaton's Cooper Power™ series substation automation products enable utilities to comply with the new IEC 61850 Standard for grid integration and automation. The SMP Gateway platforms are designed to achieve interoperability and interconnectivity of IEDs with a wide range of supported protocols. Self Healing solutions typically need to reconfigure the system within one to five minutes. To accomplish this it may require communications bandwidth in excess of what is typically provided by AMI systems (5-8 kbps). A utility can enable feeder automation solutions using a mix of higher bandwidth radios, cellular, fiber optic and WiMAX or BPL. Cooper Power Systems offers flexible communications options allowing the utilities to leverage existing communication infrastructures and upgrade to newer communication infrastructures in the future. Tollgrade Communications - Cranberry Township, PA - Tollgrade's fault detection hardware and predictive analytics software is deployed on four continents to help operators avoid network outages and reduce customer downtime. IEEE/PES Distribution Automation Tutorial 2007/2008 - Each section has an attached Powerpoint presentation. Some sections have a supporting text. NIST Smart Grid - Distribution Automation White Paper, ver 2 (doc) - more than scope but possibly not complete White Paper. May need more on actual Smart Grid Challenges (e.g. gaps in standards and recommended practices). Xanthus Consulting International - Report to the California Energy Commission on the Benefits and Challenges of Distribution Automation (pdf) the complete report from which the White Paper above was extracted. “IntelliGrid Architecture”, EPRI's IntelliGridSM initiative is creating the technical foundation for a smart power grid that links electricity with communications and computer control to achieve tremendous gains in reliability, capacity, and customer services. A major early product is the IntelliGrid Architecture, an open standards, requirements-based approach for integrating data networks and equipment that enables interoperability between products and systems.